Description Enjoy two successful independent games from Digerati! This pack contains the colorful splashform game INK and the bouncing ball game Hacky Zack. The world's first splatchform game! 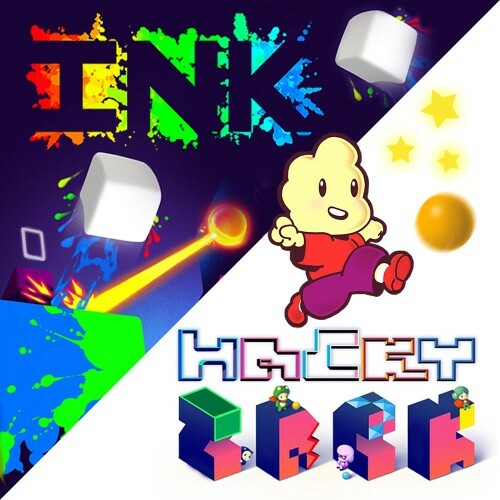 INK is a frantic game with a peculiarity: the invisible levels must be splashed with bright paint to be seen! Reveal levels by splashing: double jumping, sliding on the walls or crushing enemies. Even losing is useful: the character then explodes in a shower of colors, painting the surroundings for the next test! You are Zack. Jug with balls, bounce off walls and avoid the deadly traps to triumph over 100 levels of precision platform. Collect stickers throughout your adventure to unlock levels of time trial challenges as well as additional playable characters (who are also super cute! ).